I recently learned about Magda Gerber’s approach when I read the book, “Respecting Babies“, by Ruth Anne Hammond. I purchased the book because I’ve had a very difficult time with our second daughter, Julianna, who is now 5 1/2 months old. We also have a 2 1/2 year old daughter, Cassidy, and I stay home with the two of them. Julianna screamed inconsolably for many hours each day for the first few months of her life, which was very difficult for all of us, especially her sister Cassidy. We’re not quite sure why – she was diagnosed with dyschezia, so we think it was probably the combination of stomach discomfort and overtiredness. Although she’s gotten better as her digestive system has matured and she has learned to put herself to sleep, she still gets fussy throughout the day. I enjoyed reading Ruth’s book and I’ve started putting Magda Gerber’s suggestions into action: slowing down, talking to Julianna as we do things, taking the mobile off the changing table and having her look at me while we change her diaper, etc. I’m running into difficulty, however, when I try to let her play independently. She will lie on a blanket and play with her toys for awhile (10 minutes or so), but then she seems to get bored and starts to scream until she is picked up. The screaming upsets Cassidy, which is why it’s hard for me to let her cry for very long. To tell the truth, it upsets me too. I wish there were a video or some way to watch parents implement the RIE approach. I watched the videos you posted on YouTube so I can see how happy babies can be when they are allowed to play independently. I just need some help getting Julianna to that place. My inclination is to let her cry for a few minutes to see if she’ll stop, but so far when I’ve tried that, it hasn’t worked. She just cries harder. Do you have any recommendations? I’m sorry to hear that you and Julianna have had such a rough start. I can empathize with spending months trying to comfort a screaming baby. My third child had terrible colic that would bother him in the late afternoons and kept him (well, both of us) up for hours in the middle of each night. I’m not familiar with dyschezia, but I learned through Magda Gerber that colicky infants are especially sensitive to overstimulation and really need that quiet environment, which isn’t always easy to provide when you have older children. 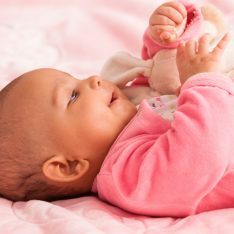 The instinct we have to comfort digestive issues by nursing, rocking and distracting an infant often leads to over-stimulation and can make it harder for a baby to settle and sleep. After those first months my son grew out of his colic, and he is also one of the infants you saw in the videos playing joyfully at 4 months old. That’s because we placed him on his back on blankets indoors and outdoors to move and look around whenever he wasn’t eating, bathing, having his diaper changed, or needing snuggles. This was helpful for his colic, too, because being free to move his arms and legs in a peaceful setting helped ease his gas and relieve his stomach tension. If he fussed, we didn’t pick him up instantly, but talked him through it first, giving him the opportunity to self-soothe. Julianna’s ten minutes of ‘self-directed play’ on the blanket is a good beginning. But I don’t believe (and neither would Magda Gerber) that she becomes bored. Infants find so much to engage their interest in this new fascinating world that boredom is not part of their repertoire. Tiredness, discomfort from teething and digestive issues, and overstimulation definitely are. I just ‘graduated’ a group of five 2 to 2-1/2-year-olds. They have been playing in the same environment with the same basic toys each week for years, and they weren’t even close to becoming bored. Of course the screaming upsets you and Cassidy! I wouldn’t leave Julianna crying and screaming during her playtime, or anytime. Before she escalates to screaming, try getting down on the floor close to her and soothing her, stroking her and talking to her about what is going on…”I hear you crying. Are you uncomfortable?” You could even lie down next to her. She might just need your reassurance and your company. Sometimes, we give babies the impression that they only have our attention when they are picked up and held in our arms. Stay next to her while she is in on her back in an independent position and give her emotional support. If she continues to complain, ask if she needs a break and would like to be picked up. Get in the habit of encouraging her to communicate with you, if you haven’t already. If she indicates a desire to be picked up, stay seated on the floor and hold her there with you. This is what we practice in the parent/infant classes. If she calms down you can let her know you will try placing her on the floor again. When Cassidy is around, invite her sit on the floor with you and her sister. Encourage her involvement in this process. Let Julianna know that her floor time is not a time of abandonment, but a situation when she will have your quiet attention sometimes and her sister’s (probably much less quiet attention), too. She’ll be increasingly fun to watch as she becomes more mobile and able to actively explore and invent play with the toys and objects that she chooses. When she becomes more accustomed to her play time, and is in her safe cordoned off play area, you’ll be able to say, “I’m going to do some work in the kitchen now, and I’ll be back in a few minutes”. She may cry for a moment, but will calm down soon (unless she is tired, hungry or uncomfortable) because she has learned that you will return. This is all about developing new habits…slowly and steadily. Your patience will pay off. Independent play is well worth the effort! In my infant class yesterday, we observed an inspiring example of infant perseverance, independence and self-soothing. Six month old Josephine is just beginning to inch forward on her belly. She seemed to take interest in a wooden object a little more than a foot away from her. She moved a tiny bit towards it and then stopped, placed her head down on the rug and sucked her thumb. After a moment she lifted her head and inched forward a bit more, but then paused and rested again, took another thumb sucking break. She repeated this exactly a few more times, inching forward and then resting until she finally reached the toy, calm and comfortable all the while. Wow! Our goal is not to force this independence, but to be open to recognizing all a baby is capable of doing on her own and to honor it. Please hang in there, and I hope you’ll keep me posted on your progress! 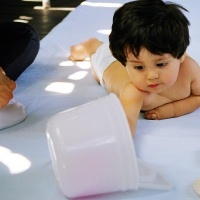 For more details about developing independent play, please read: Infant Play – Great Minds At Work, Tummy Time, Frustration And Trust, and Independent Infant Play – Make It Happen. I love the idea of altering this assumption: babies only have our attention when they are picked up. No wonder they want to be picked up so much! I would if that was the basic assumption and behavior of all around me. It wouldn’t be rocket science. This is one of those insidious assumptions that is widespread and unconscious and I think it connects to our DOING-oriented culture, not BEING. I may need to blog about this as I am getting lots of ideas and connecting thoughts here! It additionally connects to how stressed parents are, that a chance to put the baby down is usually linked with all that we want/need to get DONE, so we don’t tend to just sit there next to the baby. We are often wanting to get away, so do that and we’re rushing and it backfires. Miven, you have a wonderful way of zeroing in on the crux of an issue and delving deeper. I always appreciate your insights! I agree that our culture focuses on ‘doing’ together, rather than just ‘being’ and allowing activity to evolve, or not. Parents in the RIE classes often comment that their babies play so much ‘better’ there, and I believe it’s because we have let go of ‘doing’, left all our distracting activities behind and are just quietly present with our babies. I always say, “Please do try this at home!” Letting go and giving our full attention for a few minutes is good for all of us. Miven, please share your connecting thoughts and ideas on your new blog! (http://losangeleschildtherapist.com) I’ll look forward to hearing them! I can relate well to your problem CC. My daughter (now 22 months old) had terrible reflux for the first 8 months of her life. I started going to Baby Focus/RIE classes when she was 12 weeks old. I really enjoyed the classes, but Maddison would scream after being on her back for more than a minute. I would lie down with her and speak to her “I can see your upset, but I don’t know how I can help you” which was true, because everything the doctors, midwifes, plunket nurses suggested never worked well enough to let her have that extended play time on her back. When I talk to the friends I made in those classes now, they can remember Maddisons constant screaming. It was unbelievably hard on me. All the other babies were fine, so what was I doing wrong? As she got older it became easier, but it wasn’t really until she was 8 months that she would play/explore happily. I felt bad that she was in my arms alot of the time, when she should have been on the floor, but I did what I had to do, and it has worked out well in the end. I understand how hard it is for you now, there is nothing worse than constant screaming day after day, month after month, but it will pass. Maddison is still quite sensitive, and usually has a good cry everyday, but the constant screaming has gone, and she plays wonderfully now. Our care times are still special 🙂 and because I have talked to her about everything I am about to do with her etc, she is a wonderful communicator. I hope this helps, the screaming will pass, you just have to do what you think is right 🙂 The RIE philosophy is absolutely wonderful, and worth sticking with, even though it is incredibly hard when your baby is screaming all the time. Thank you all so much for your advice, especially the reminder that babies don’t get bored. I have to admit, I often try to do other things when Julianna is playing on the floor. It’s good to be reminded of the importance of just being with her. Sometimes it’s hard to just spend time observing Julianna when Cassidy is begging that I play with her, but I’m trying to help Cassidy learn to play independently too. I’ve realized that I probably should have used the RIE approach with Cassidy, but I hadn’t even heard of it until I read Ruth Anne Hammond’s book a few months ago. I made the mistake of constantly interacting with Cassidy when she was little so now I have a child that wants constant interaction. I’m going to implement some of your tips like talking to Julianna when she seems upset or uncomfortable instead of just picking her up and distracting her. She is a bit older now (almost 7 months) and much more content. Her stomach no longer seems to bother her. She can play independently for longer periods of time although now she’s developed separation anxiety so she gets really upset when she sees me leave the room. In the meantime, if you have any more tips about helping older children like Cassidy (2 1/2 years old) learn to play independently, I’d love to hear them. I read your post about having your child play alone at the park, but the weather in Seattle is nasty at this time of year and we often can’t get outside. Thanks again for your wonderful advice. I found it helpful to make it clear to my older child that I was setting aside time for just the two of us. Maybe it could be during Julianna’s nap time, or maybe when her dad or another caregiver is available to stay with Julianna. It doesn’t have to be a long period of time. Thirty minutes is enough. When Cassidy is being demanding and you need time with Julianna, remind her that you will have this special time together later, and that you are looking forward to it. If she still cries and complains, say, “I know you want my attention right now and this is very hard for you. We’ll have our time a little later, at two o’clock” (or whatever). Try to let her have her feelings, acknowledge them, but continue with what you are doing, even if she has a tantrum. Be empathetic, but firm. Don’t react out of guilt. Then, let Cassidy decide what she wants to do during your designated time together and stay in responsive mode (as I suggest in the “Solo Engagement” post). Don’t suggest an activity, let her do that. You might just end up sitting and holding her, giving her quiet reassurance that she is still extremely special to you. It might be easier to try to get away somewhere child friendly that she likes — the library, the book store, the coffee shop. But it’s not about doing something, just paying attention, being fully present. Becoming a big sister or brother is a huge transition. Caitlin, you have a lot on your plate. Please ask me anything else, keep me posted, and stay warm! Thanks again, Janet, for your help. I have been spending “special time” with Cassidy for the past few months and she loves it. Usually we have “special time” during Julianna’s morning nap. I find I have to set a timer, however, otherwise she’ll want me to spend the whole hour and a half with her. Our “special time” almost always consists of playacting, which doesn’t appear to align with the independent play that you recommend. Cassidy loves to act out situations that we have been in. They are usually situations that involve some sort of discomfort on her end. For example, she likes to pretend that she is the doctor giving shots and I am the child. She tells me to cry after she gives me the shot. Another example is the drop-off day at the co-op preschool we participate in. She likes to pretend that she’s the mommy and has to leave me at preschool. Once again, she tells me to cry when she leaves. I just go along with whatever she wants to play, since it’s our “special time” and she’s the one who decides what we do. My question is: Is pretend play the kind of activity you would recommend? If not, how do I shift her to an activity that doesn’t involve my direct participation? Thanks again. I really appreciate your advice. I came to your website just now looking for an answer to this very question, and was pleased to see that you had already responded. I love your site and the ideas of Magda Gerber. I have been doing my best to put them into practice since my son came home from the hospital. However, he is now 7 1/2 months old, and we have somehow developed this problem. I say “we”, but it must be something I am doing wrong. I spend a LOT of time with him during the day just sitting and observing him play, but it seems that his willingness to play independently has actually shortened as time has gone on. He will whine, scream, and cry at the top of his lungs if I come anywhere within his line if sight– even if he had been playing quietly and contentedly with his dad for 30 minutes prior. It seems that he has come to associate “mom” with… I don’t know what. Being held? I hope you can help me to decipher what is going on with my son and what I might be doing wrong. I try not to intervene too quickly– e.g. if he is struggling towards a toy or trying to figure out how something works. But nonetheless, he will just look at me, roll onto his back, and literally start kicking and screaming until I pick him up. This makes for extremely long days, and a rather sad and frustrated mommy. I feel like I have tried so hard, but failed. Don’t dismay! You are doing nothing “wrong” at all. It sounds like your boy is associating you with you, his mommy. It’s normal for him to prefer your company at his age. He may also be experiencing separation anxiety, which classically begins at around this time and is also very normal. You don’t say how long this behavior has gone on, but I assure you it is a phase that he will pass through… I’m also wondering if he’s teething… And he may be on the verge of greater mobility…scooting himself on his tummy. When babies are just about to achieve new milestones they are often more clingy. When he is communicating his need for you, you must respond. What I’m most interested in is the way you are responding. Acknowledge him honestly right away, “Wow! You really want my attention. I hear that!” Sometimes, you may not be able to stop what you are doing immediately, but whenever you can, stop and go to him. If his dad is with him, let him be the one to intervene. “Mommy’s busy, but I’m here. Do you want me to pick you up?” It’s okay for him to cry with his daddy when he wants you… In fact, it’s good for their bonding. He needs to continue to associate his play space with time together with you as well as apart. As you say, you’ve spend lots of time sitting & observing him. But also welcome him in your arms while you sit together. Since that is “his” time, let it be his to be with you as he wishes. His ability to play independently will return soon. Try not to get frustrated with him, because he picks up your tension and it can make him feel uneasy and more needy. It would be so much easier to advise you if I could see you two in action, but please fill me in with any other details that might help me help you. One thing I know for sure…this too shall pass! I want to thank you for taking the time to write such a thoughtful and compassionate response. The love and care in your writing, and the RIE approach, is what brings me back to it, intuitively, over and over. I think what was happening with me and my son is that over the course of time, I was “sneaking in” more chores and other tasks during the day, and not truly giving him those uninterrupted chunks of attention the way I did starting out. So I really refocused and even set the timer to check in with how long 30 minutes of pure focus really is. It’s hard for a multitasker like me! As a result, my son is much happier and the yelling completely stopped, pretty much right away. He was trying to tell me that I wasn’t being fully present with him as much as he needs and wants. I must also say, though, that my house has been a complete disaster for the past two weeks, a home-cooked meal has become an extreme rarity, and I really haven’t touched any of the other tasks I have on my plate right now. So I’m not sure how to sustain this long-term. You are correct that he is both working on new teeth and new mobility right now, so that is making my mellow guy a little bit more “high needs” right now. I can totally handle it, but I’m also looking forward to finding that ever-elusive balance between our together time and his independent play where I can get even just the basics done. PS We are in Orange County, and I am really considering making the trek once a week to a RIE class in LA County. I think it would benefit me and my son a lot! And I don’t think the housework matters so much, but you need to take care of yourself and have breaks from him. Yes, the challenge is to find balance. I just wanted to check back in and update you on our progress. Thank you so much for your advice to “accept his disagreement (crying and screaming)”. I have been very fearful of doing this, thinking that I would be harming my son in some way. Since my last post, I feel I have made great strides in slowing down my multitasking habits and focusing on my son while he is at play. But I have not yet mastered the art of “accepting his disagreement”. You are right, he almost never gives me permission to leave him! He stands at the gate of his play area and screams. What’s more, he still screams when he doesn’t get something he wants fast enough, or when he reaches for an object I don’t want him to have (e.g., utensils at a restaurant). I find this embarrassing in public, but perhaps that is a whole different topic. I am going to work next on, as you said, being confident and just GOING. He only does this screaming with me, not with my husband. So, he has figured out that it works with me. I need to gently break that cycle. I will certainly acknowledge him in the process, but I need to get up the nerve to take breaks from him. I know it will be the healthiest thing for both of us. Right now, he is too much in charge of my day, and ultimately that is not what is best for him! Thank you so much for the update. Glad to hear you’re working on letting go and slowing down. Yes, it does sound like your soft-hearted responses are encouraging the screaming. How insightful you are! Remember that in this case, his screams are not from intense pain or emotion. This is some high drama that he’s learned “works” with you (as you say). Later this might become a whine, “please mommy, please mommy, please mommy,” or full on temper tantrums every time he wants something and you say NO. That isn’t going to be good for either of you. I just want to thank you for your lovely description of responsive parenting, and the encouragement in your words. 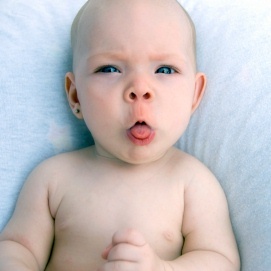 Your true respect for babies shines through in your posts and comments here. When it finally dawned on me that babies are PEOPLE — that we can (and should) listen (and talk) to them, and understand the difference in developmental progress from one month to the next…parenting got so much easier (and more rewarding). You’re helping a lot of families here! Dr. Heather, Thank you! I appreciate the wonderful guidance you share on your site. I visit it often. Aloha! 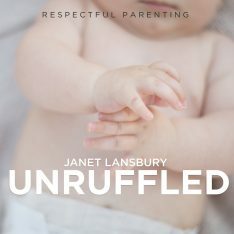 Janet – I too am constantly amazed and inspired by your kindness not only with babies but with parents as well. Your responses are always so affirming and constructive. I feel I’m learning from you not only about babies but about how to be respectful of everyone! This post is timely for me as well. My daughter is almost 4 months old. Until recently she was increasingly content to spend short times by herself lying and playing on the floor either with me present or off doing other things. Lately though she screams both when I walk away and sometimes while I’m sitting and watching her. I think she may have started teething so perhaps this is related? Sometimes the screams are hard for me to interpret because she’s not actually crying. Sometimes it sounds like she’s experimenting with new sounds and sometimes it sounds like she’s distressed and sometimes it sounds like a combo!!!! Thus I’m a little perplexed as to how to respond. I tell her I hear her and that I’m not exactly sure what she wants. I often feel like I make mistakes and either pick her up when she actually needs time to settle on her own or I let her lie there tip long and she gets upset. Your post is helpful in reminding me that development is not linear and that patience both with myself and with Sylvie is helpful. I love reading your blog! Thanks for your kind words, Elanne! This sounds like teething to me, too, and Sylvie is right on schedule. Whereas I wouldn’t place a teether in a baby’s mouth or hands, I’d offer Sylvie two different teethers and allow her to grasp the one she would like to use. It’s good to begin asking Sylvie if she would like to be picked up (if you aren’t already doing that). She can indicate what she wants by moving her arms, kicking her legs, or telling you with her eyes. Yes, please, by all means be patient with yourself while you learn all about your unique little girl. Magda Gerber referred to the first several months with a new baby as “two awkward adolescents learning to dance together”. You are obviously an extremely sensitive, aware and mindful mommy, so keep up the wonderful work! I like that quote from Magda. Takes a bit of the pressure off! A question about teethers. I have a couple of teething rings and I have tried offering both of them to Sylvie so she can take the one she wants. She does take one (after a long while of looking at both of them, very sweet!) but she still isn’t quite coordinated enough to hang onto it and hold it in her mouth and chew on it. She winds up getting frustrated. It’s so tempting for me to hold it in her mouth but I haven’t because I want to wait for her to choose that. So instead I offer her my finger and let her chew my finger if she wants to. Do you have any other suggestions? I know soon enough she’ll be able to do the whole thing herself, so perhaps it’s just a matter of waiting. I wouldn’t worry about giving her a helping hand by saying, “I’m going to hold this steady for you’,” while still allowing her to lead the way. And there’s nothing wrong with mom’s finger, but helpful strangers’ fingers are another story. This article is a great read and offers some tips for things I hope will help our 6 month old little guy. He screams and cries unless he is being held and even when he is being held he whines. Our 2.5 year old daughter would sit and play by herself for hours at this age so it is extremely frustrating for our son to be the exact opposite. Any suggestions to get him to even lay down and be by himself for 5 minutes?!? I don’t even know where to start. . . This worn down mama appreciates any help you can offer! Wow! This has changed everything for me! So the first day I did play time this way it went flawlessly I couldn’t believe how content she was and the freedom and stress relief it gave me. The second day was little less great and today she cried every time I left her eye sight… I would lovingly sit and hold her and after that I could not lay her down again she just wanted to be held. So my question is how much crying is just frustration? It did usually happen after she dropped a toy but I would sit and encourage her and say I’m here Mama’s here… But nothing was good enough. My LO is only four months.